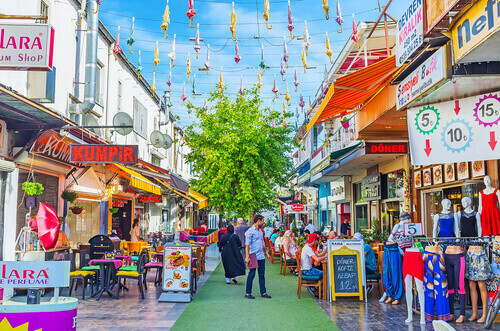 The largest Turkish city on the Mediterranean coast, Antalya has become a hub for international visitors in recent years with its mix of glorious weather, stunning views and historical places of interest. Although founded as a city by the Ancient Greeks, Antalya is best known as a former Roman port. 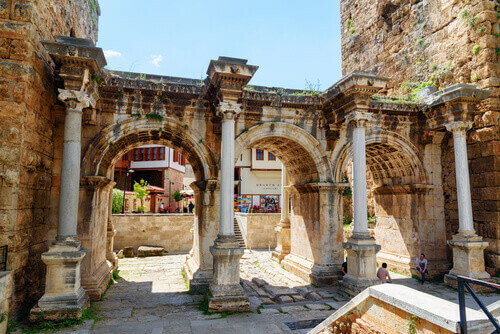 Its economic and geographical expansion during this period is immortalised by Hadrian’s Gate, built to honour the eponymous Roman emperor upon his visit to Antalya in 130 AD. An entrance to the old town of Kaleiçi, walk underneath its three, 8 metre high arches and marvel at the ornate carvings and details that pay tribute to an iconic ruler. The four white marble and granite columns that stand in front of the façades complete its classical Roman structure. Either side of Hadrian’s Gate are two towers, preserving two different eras of Antalya’s history. One has survived from the Roman era, while the other was built during the reign of 13th-century Ottoman Seljuk sultan Alaeddin Keykubat and features inscriptions in Arabic. The blend of Roman and Ottoman architecture continues inside the Kaleiçi district, a short walk from the gate and a bustling centre of shops, restaurants and cafes compact enough to navigate on foot. The Yivli Minare, a fluted minaret, stands at 38 m high and is another historical site that should be easy to spot and explore. Part of a the Yivli Minare Mosque that was destroyed then rebuilt during the Ottoman era, its dark blue tiles create a striking impression on the Antalya skyline. Explore the domed structures of the surrounding buildings and the octagonal layout of the rebuilt mosque. 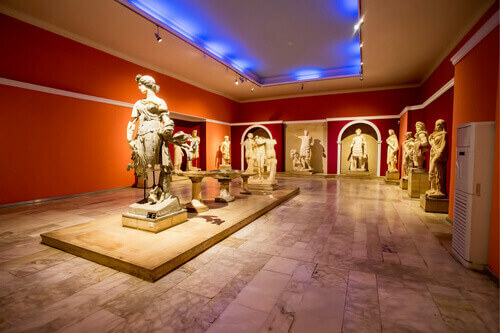 Tourists enjoying a longer stay may wish to journey to the edge of the city to visit the Antalya Archaeological Museum. The city’s two tram systems are ideal for getting around and the older route will take you there, with fares as little as 3TL (AU$0.80). The museum celebrates its centenary in 2019 but was moved from Kaleiçi to its current site in 1970s, having grown from a humble project to protect excavated artefacts into a 14-hall building with an open-air gallery. Its mosaics, sculptures, garments and weapons span from the Neolithic and Bronze ages through the Hellenistic, Roman and Ottoman periods. Every visitor should have time to enjoy Antalya’s local cuisine. As you would expect from a port city, it boasts plenty of fresh seafood dishes, alongside the traditional Turkish fare of grilled meats, salads and mezze. The city’s famous goat’s milk ice cream – available in a variety of bright colours and vibrant flavours – should be enough to cap a filling meal or just help keep cool in the warm weather. 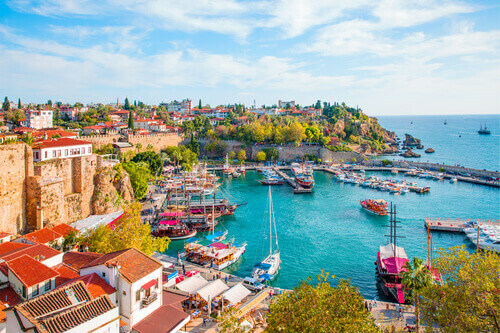 When you’ve finished exploring the city, head to the water to enjoy Antalya’s other main attraction: the historic Roman Harbour, overlooking the the turquoise coast. It’s the perfect place to unwind, browse the bazaars then watch the sun set behind the yachts while you savour the view from one its many cafes or Blue Flag beaches.